Each $64 box contains 24 packs. Each pack contains 6 cards. Each 2015 Topps Doctor Who Trading Cards box delivers 2 "HITS" from the following list: Autographs, TARDIS Patch Cards, Costume Relic Cards, Signed Costume Relic & TARDIS Patch Cards, Printing Plates & Signed Printing Plates! In addition, every Box will yield approximately 27 Subset Insert Cards! This set documents the history of this classic TV franchise from past to present to deliver fans and collectors a fun and exciting experience. 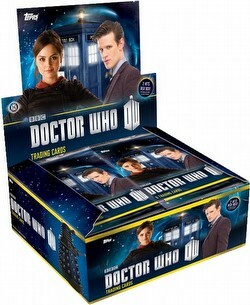 Inserts include Memorable Moments (1:2 Packs), Companions (1:4), Christmas Time (1:6), The Doctor Is In (1:8), and Gadgets (1:12). Look for over 20 different Autographs, Autograph Parallels (Blue #'d to 50, Purple #'d to 25, Red #'d to 10, & Gold 1/1), Dual & Triple Autographs (#'d to 3), 5 different Costume Relics, Autographed Wardrobe Relics (#'d to 5), Autographed Patches, 1000 different Printing Plates, and Autographed Printing Plates. There are 200 cards in the base set (165 character cards and 35 storyline cards).